A veteran of World War I, British RAF Captain C.K. 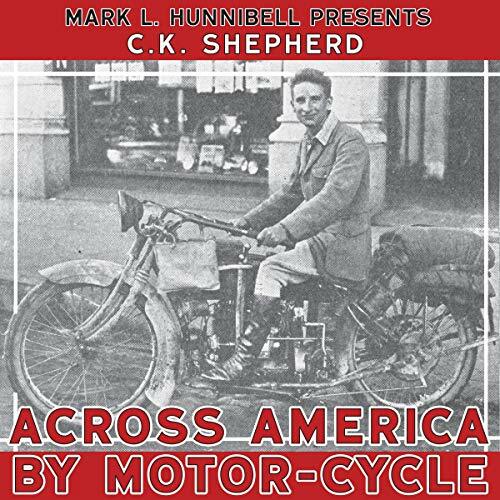 Shepherd arrived in New York in June 1919, bought a top-of-the-line Henderson four-cylinder motorcycle, and headed west on a solo cross-country adventure to see America. He set off on his adventures, arriving in San Francisco two months later. Having completed his voyage, he sold his beloved motorcycle, dubbed “Lizzie”, on the street in San Francisco and then made his way back to his home in Birmingham, England. Three years later, he wrote Across America by Motor-Cycle - a memoir and travelogue that has become a motorcycle history classic. The 1922 book is now in the public domain and has been reprinted and made electronically available by others besides me. However, this is the first known production of the book in audio format. The entire recording has been painstakingly made by reference to a digital copy of the book newly scanned from an original print of the hardcover book as published in 1922. All words in the original book are spoken in a voice selected to most closely represent that of C.K. Shepherd as well as all of the "characters" about whom C.K. wrote. This audiobook will provide listeners with a new way to appreciate this wonderful adventure. Enjoy! I’m glad I listened to this story. Really cool hearing a 1919 view of crossing the country on a cool bike. The narrator was great as well.